It’s that time of year again! 1st quarter always seems to be the best time to have an annual review meeting with your 401k plan clients since shortly you’ll be receiving year-end data and running the customary investment due diligence reports. In order to help your clients have a successful and compliant plan, every year it’s important to review certain aspects of the plan to monitor plan compliance and document how well the plan is being managed in accordance with regulations and guidelines. The trick is to not overwhelm or overload your plan sponsors with a 4-hour plan review meeting (yes, it happens). 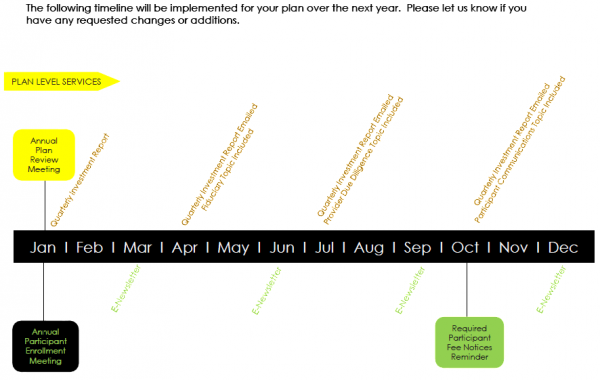 So, what should you cover with your clients at the annual plan review meeting? FIRST: Review the prior year activity. SECOND: Review and update the Investment Policy Statement if necessary. The easiest way to increase liability on a retirement plan is to have an IPS and not follow it. 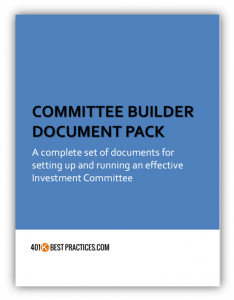 The annual review meeting is the best time to pull out that document, review what the guidelines are for the management of plan assets, and verify the plan is actually being managed in accordance with those guidelines. If there are any changes to the plan, asset classes held, etc., that might warrant an update of this document, this is the time to identify and update the IPS if needed. 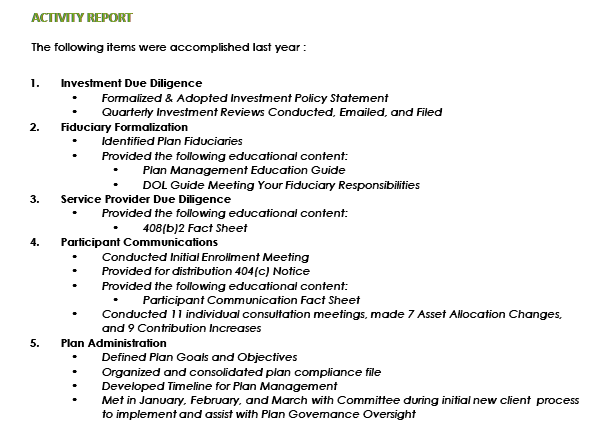 NEXT: Review plan investment performance. Depending on plan size, this might be an annual event or part of an ongoing quarterly service. Regardless, this is an opportunity to ensure that the investments in the plan remain suitable and appropriate for the plan participants. Any discussion regarding plan investment performance, benchmarking, or changes needs to be fully documented since ERISA’s test of prudence is one based on process and not performance. FINALLY: Implement a success timeline. 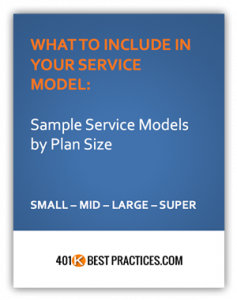 This simply means, ensure that you have a proactive service schedule in place and you and your clients know what that looks like and what to expect and when in the new year. By scheduling out key management events and customer service interactions, you demonstrate a reliable process and create a more professional approach to managing your business and client expectations. ADD ON: Provide education surrounding fiduciary responsibilities. Just know that you don’t have to cover everything all in one LONG, annual review meeting. There are better and more efficient methods for helping plan sponsors document their key plan management responsibilities.